W.O.W Media, is the production arm of Family Policy Institute. 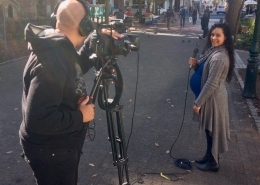 W.O.W Media produces two programs for Television. “Watchmen on the Wall”, broadcast on “Faith Broadcasting Network” on Tuesdays at 6:30pm addresses current affairs and breaking news from a Biblical perspective. “Salt & Light”, broadcast twice-weekly on “TBN in Africa” channel on DStv channel 343 – Sundays at 6pm and Repeated on Wednesdays at 12noon. Salt & Light focus on marriage and family issues and will also highlight the efforts of ordinary Christians who are actively being salt & light in society. We will also share vital information about key social issues in this program. Our weekly radio program, “Watchmen on the Wall Radio” is currently being broadcast on several Christian radio channels across the country. Here we address the most compelling debates of the week.